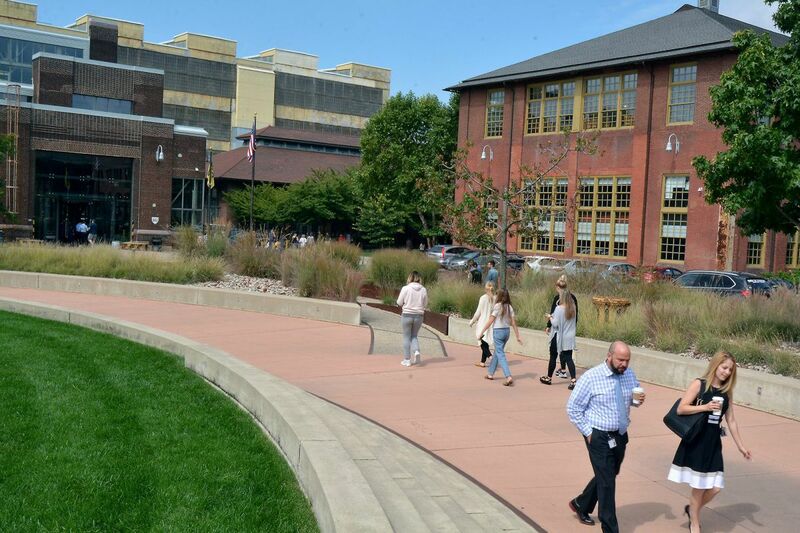 Workers at the Navy Yard business and industrial park in South Philadelphia, one of the sites that the city is expected to proposed to Amazon for its planned second headquarters campus. Pennsylvania officials plan to offer Amazon more than $1 billion in tax incentives if the e-commerce giant locates its planned second headquarters campus in the state, the head of the Philadelphia area's main business group said. Rob Wonderling, president of the Chamber of Commerce for Greater Philadelphia, said in an interview Tuesday that the tax breaks would be an extra enticement on top of Pennsylvania's existing draws. State legislators highlighted Pennsylvania's educational institutions and high-tech workforce in an online letter to Amazon.com Inc. this month. Wonderling declined to specify in any more detail how much state officials planned to authorize in incentives for Amazon, citing a nondisclosure agreement surrounding his talks with leaders. Gov. Wolf's spokesman, J.J. Abbott, said in an email Wednesday that details of any incentive offers would not be made public before Amazon's Thursday deadline for accepting headquarters site proposals. "To preserve competitive advantages of these proposals, it would be premature to share while other states are still able to amend their bids," he said. Amazon said it plans to employ 50,000 skilled workers at a second headquarters campus — nicknamed HQ2 — outside its native Seattle. The plans call for spending $5 billion to develop millions of square feet of new office space. Construction and ongoing operations of the campus are expected to create tens of thousands of additional jobs and tens of billions of dollars in additional investment in surrounding communities, Wolf said in a Wednesday release. Wisconsin's proposed $3 billion in tax breaks for Chinese electronics manufacturer Foxconn Technology Group to open a U.S. plant there served as a model for Pennsylvania leaders in their discussions, Wonderling said. He declined to compare those breaks with what Pennsylvania plans to offer Amazon. Separately, Philadelphia City Councilman David Oh proposed legislation last month that would grant a city tax exemption to "new mega-businesses" matching the planned headquarters' description. The bill, which is to be considered by Council's finance committee, would absolve the company from paying the city's business net income tax for 10 years, for a savings of up to $2 billion. Philadelphia also has been releasing a series of videos this week featuring promotional remarks by local business, academic and cultural leaders in the leadup to its bid submission on Thursday. The third of the videos, released Wednesday, focuses on the city's diversity; affordability; and recreation, cultural and dining options, with remarks by Iroko Pharmaceuticals LLC founder Osagie Imasogie and Yards Brewing Co. operations chief Trevor Pritchett. Pennsylvania metropolitan areas Philadelphia and Pittsburgh were ranked the top two choices in North America for the second Amazon headquarters in a Moody's Analytics Inc. analysis that included geographic location in addition to preferences stated in the company's request for proposals. Other Pennsylvania municipalities expected to submit bids include Delaware County with the city of Chester and Bensalem Township in Bucks County. Pennsylvania also plans to submit a state-level proposal to accompany the bids from individual municipal governments, according to Wolf's statement. "We believe we have the strongest proposal and are extremely well-positioned to win this project," the governor said. "We are proud to have coalesced all of our state leaders and partners in this effort and would be proud to be the home of Amazon HQ2."